2018 has not been an active year for tornados. With May, the most active month for tornados nearly complete, only 416 tornados have been reported. This is, by any scientific measure, over 35% lower than the long-term average, and according to the Storm Prediction Center, in the bottom quartile for tornado activity. This Memorial Day storm chase almost came as a surprise. First of all, I typically travel Memorial Day Weekend, as does a lot of people. Also, with the season being as inactive as it has been, there had been plenty of days throughout May where forecast models looked promising for a good storm chase several days to a week ahead of time, only for the atmospheric setup to never materalize. While some aspects of weather forecasting have become quite accurate, forecasting weather beyond a few days, and forecasting weather phenomenon on a small spatial scale remains a challenge. Thus, those that long to see what is perhaps nature’s most violent storm, tornados, can do one of two things. They can set aside a period of time, typically sometime either in May or early June to go out and look for storms. Several companies offer this service, a set 7 to 10 day chase in vans like these ones. However, even in May, there is no guarantee that any kind of active thunderstorms will be happening, let alone tornados. Those that have ever chased in this manner end up becoming familiar with all sorts of oddball attractions in the Great Plains! There are also those that keep an eye on weather outlooks, deciding to go when the setup looks good. This requires some often last minute decision making, and sometimes chaining plans. This is what I did on Memorial Day. A day that started out slowly, with brunch in Cherry Creek, quickly transitioned to traveling due east out of Denver, straight into the storm. Still, even if this tactic guarantees that there will be activity, it does not guarantee that there will be tornadoes. There is still some element of luck to it. Near the tiny town of Cope, Colorado, the sky had an interesting orange hue to it with what appeared to be a funnel cloud. This can actually happen quite frequently without an actual tornado being spotted. At that point in time, around 4:30 P.M., we made two decisions that would put us in the right position to view the tornados. First, we decided to get to the East side of the storms before they became big. Second, we decided, due to Eastern Colorado’s sometimes limited road network, to actually use dirt roads, something that can, at times, be dangerous in the case of a flood. The first tornado, Southwest of Cope, we saw kind of in the distance. We traveled south, along a dirt road, to get a closer view of it, however, we eventually saw it dissipate. Still, the entire time, cloud formations indicated a strong low-level rotation, conditions necessary for tornado development. There was even a “landspout” and several dust devils between the storms. Before long, two new tornados were spinning up, just a bit to the South and East of where we had seen the first one. The strange thing about these storms was that they were first visible on the ground, with clouds of debris extending outward from both emerging funnels. Watching them develop proved quite remarkable. First the funnels showed, then we actually got to see the darker clouds of debris around the funnel fill in from the ground up, forming two side-by-side fully mature tornados. The funnels were on the ground for about half an hour. They gradually evolved, taking on different forms, giving way to yet another tornado, a bit further South and East, near a tiny town called Vona, CO.
As a person with many interests, I only end up storm chasing several days per year. In the past several years, this was by far the most successful chase day. Even for the most knowledgable chasers, just seeing a tornado constitutes a successful day. Seeing four of them, as well as being able to watch tornados form is nothing short of amazing! I am also always glad to see when tornados are not actually impacting people where they live. One thing I notice is that storm chasing continues to become more and more popular with time. There were several instances where we encountered large groups of people, just like this one, looking at and taking pictures of tornadoes. This is all good, but I do concern myself with how the people who live in these areas perceive this activity. We storm chasers should never be delighting in the destruction of anyone’s home or town, and I am concerned that the perception as such could lead to some resentment among the people who live in tornado prone areas, particularly the Great Plains, which far Eastern Colorado is part of. Not only was it one of the most successful chases of my life, but it also was quite possibly the most efficient chase I have ever been a part of. It started after what turned out to be a 90 minute brunch, and that evening I was back in Denver seeing a concert at Red Rocks Amphitheater. The perfect storm chase, like the perfect setup when it comes to things like jobs, relationships, communities and homes, results from the intersection of good decisions and good luck. The former can be controlled. The later cannot. Just as I have been on many other storm chases where my group made all the right decisions but still did not see any tornados, the same can happen in all of our pursuits. All we can do is continue to go out there, make the right decisions, execute properly, knowing that the luck will eventually materialize even if it takes several more tries. 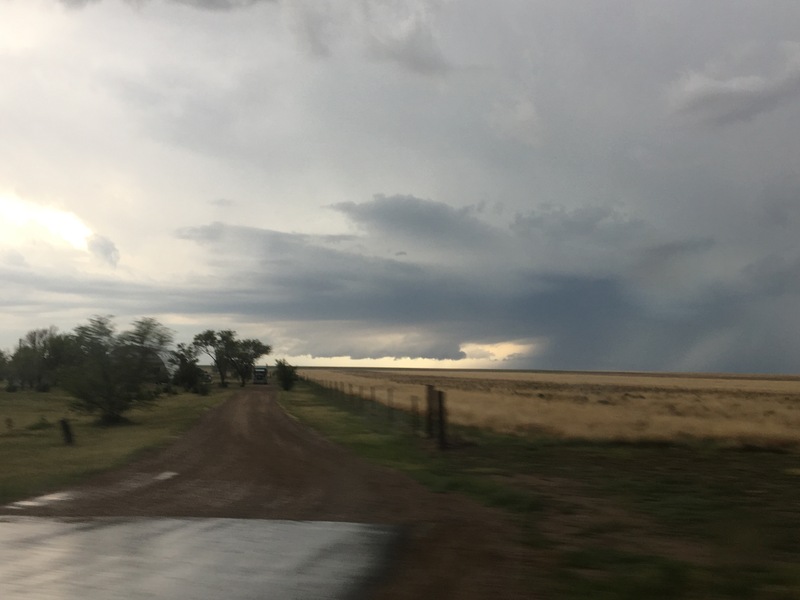 This entry was posted in Colorado, decisions, Storm Chasing, storms, tornadoes, weather and tagged Eastern Colorado, Memorial Day, meteorology, Storm Chasing, tornado, weather on May 30, 2018 by Stephen Jaye. Week after week is spent focusing on some sort of life endeavor; a major project at work, a personal improvement initiative, a diet, starting a business, preparing for kids. Meanwhile, the world around us continues to tick. All of a sudden we realize that everything has changed. A jacket is no longer needed in the morning. Darkness does not set in until well after 8 P.M. Every evening, the neighborhood kids are outside being lively. While our focus had been elsewhere, the subtle process of seasonal transition has transformed the world around us. It is now summer! Although it has felt like summer, here in Colorado, for a few weeks, in the United States, Memorial Day is often referred to as some sort of unofficial beginning to summer. With most businesses not providing time off for the Easter holiday, and Cesar Chavez Day being a holiday in only two states, for many, Memorial Day is the first day off in several months. I have even had a pervious employment situation where there were no holidays between New Years Day and Memorial Day. With vacation shaming running rampant in this country, causing Americans to collectively leave over 700 million vacation days unused annually, it is easy to imagine countless American who spent the three months leading up to Memorial Day doing little else besides work and tending to home and family needs. 2018 in particular was a year where the Spring Season was easy to miss, as winter felt quite persistent across much of the country through April. Chicago even reported measurable snow four times in the Month of April! Many experienced the kind of weather they typically associate with Spring only briefly before summer-like conditions spread across the country. By Memorial Day, 100 degree temperatures were reached in Minneapolis, while the Florida Panhandle was experiencing the start of the tropical storm season. While it is completely understandable why some people were completely blindsided by the start of summer, it feels, in a major way, unnatural. Seasonal cycles are embedded in how our culture developed, flushed and progressed. They can be seen in the way our calendars were constructed, the holidays we celebrate, the traditions we all enjoy and even in art and music. Perhaps most importantly, they guarantee that we must periodically stop what we are doing, and move on to a new set of experiences and a different kind of energy. In a way, they guarantee progress. All the major biomes in the Colorado Rocky mountains were alive this Memorial Day weekend, as if they knew this Memorial Day deadline for the start of summer existed and needed to be complied with. The Aspen trees glowed an almost neon green in the bright sunshine, contrasting with the pine trees in some places, while clustering up, highlighting their own light gray branches in others. Somewhere slightly above 10,000 feet (3.05 km) in elevation the forest transitions to densely packed evergreens. Nourished from the melting of the residual snow at higher elevations, they shade the ground below them with a raw power almost feels as if they are, collectively, the protectors of the mountains. Along the trail, they reveal only what they want to reveal. Periodically, they reveal small previews of what is to come, building suspense and creating an experience. Above the trees, the remnants of the snowy season, which is any time of year besides summer at 12,000 feet (3.6 km) in elevation, fades away slowly transitioning the energy of the surrounding rocks, bushes and grass. In the modern world, summertime for many feels like a time to thrive. It is often the busiest time of year. Surprisingly, this appears to be true for both weather dependent activities such as travel and recreation, as well as indoor ones. It is also the time of year where more is possible. Long days, less travel hazards, and in many cases less discomfort when outdoors gives us the chance to both let in and out a deep breath and smile, but also take our activities to the next level. Many of us did not keep our New Years resolutions, some could have even had their goals and desires forgotten about over the past few months. However, the start of a new season, indicated by the coming and passing of Memorial Day weekend, provides no better opportunity for each and every one of us to re-orient ourselves towards what we really want out of life. The coming season may be the best time to make a change- to chose life! As the floodwaters gradually recede, I look forward to the calm feeling the warmth of summer provides. I look forward to the energy of cities and towns alike, flooded with people walking to the park, walking their dogs a little longer, and to festivals and cookouts. I look forward to the energy it produces in each and every one of us, inspiring us to leave the computer screen, put down the remote, and go outside an play a little. I look forward to the brightness of the sun lightening the hearts of all of us. I look forward to seeing the lives that will be transformed by summer’s energy! This entry was posted in Colorado, culture, geography, hiking, seasons, self improvement and tagged Colorado, Memorial Day Weekend, Rocky Mountains, seasons, summertime, weather on May 29, 2018 by Stephen Jaye. May 10th was kind of a strange storm chasing day for me. It was the kind of day that calls into questions a whole bunch of things for me. What assumptions I make. How I go about making decisions. Both with regards to where and when to chase, as well as about life in a broader sense. There are so many things that end up factoring into when and where people chose to chase severe thunderstorms. I had chosen to go on this two-day chase (see day one) partially out of frustration I was experiencing back home. It was one of those situations where I felt like it would just be good for me to do something I had not done in a while, for a change of pace, and I had yet to chase in 2017. So, I went to chase on a Tuesday and Wednesday with only a slight risk for both days, something many people with jobs tend not to do, particularly when the outlook shifts so far away from home on the second day. In fact, I was not even sold on chasing again on Wednesday, as leftover storms from Tuesday would prevent the area that I had originally thought would have the best dynamic setup for storms from developing the instability needed to fuel them. 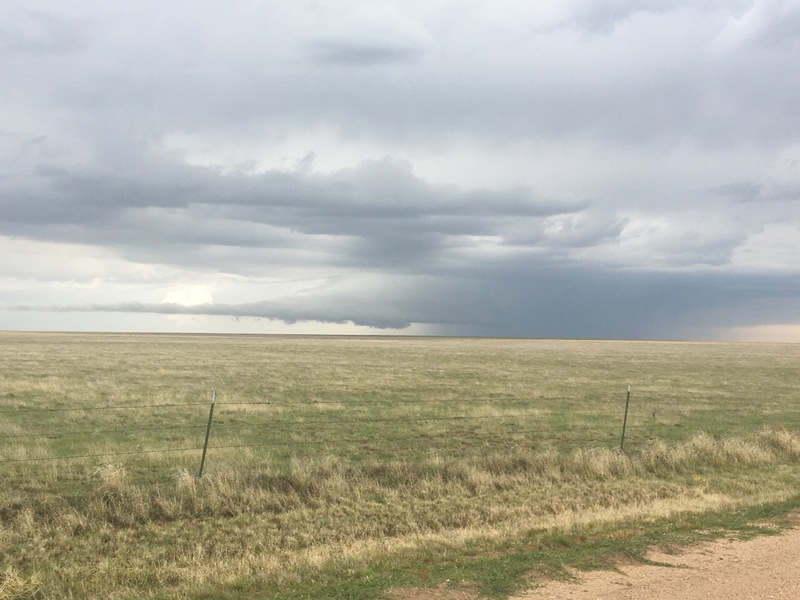 I decided to stay out partially because of the more optimistic outlook from the Storm Prediction Center, and partially because I got an email from a friend, telling me he was excited about the outlook… in Southeast Colorado. Still, I decided originally to target Southwest Kansas. Given the outlook, the best place to be would have been well further south, at least into the Texas panhandle. But, you know, those life considerations. I did want to make it back to Denver that evening. Whenever in Western Kansas, I always kind of think the same thing. This place is flat, but it is not as flat as Florida, or Northern Illinois. People often assume the place is flat. But, according to a study in National Geographic, Kansas is not even in the top 5 flattest states. One aspect of storm chasing that is often missed by people watching storm videos, or the movie Twister, is the fact that storm chasing involves a lot of driving, and it also often involves a lot of waiting. On many days, chasers pick a “target” location, where they believe storms are likely to form, and sit there, sometimes for hours, waiting for them to form. Because it was unrealistic to get down to the Texas Panhandle and still get back to Denver in the evening, we chose to sit in a town called Ulysses, Kansas because my favorite weather website had analyzed another boundary near there. Ulysses, by the way, was named after Ulysses S. Grant, Civil War general and 18th President of the United States. Why a place like this cares so much about this historical figure from Galena, Illinois confuses me a bit. But, at least the town had highways in all four cardinal directions, and an empty field with a cell tower, so we could look at weather information while we wait. And, this requires patience, and continued belief that the right location had been chosen. But, May 10th was not a typical day. Storms started to form in this region, first just clouds, and then even some small thunderstorms. I was even proud to have seen a storm start to produce rain before the RADAR images even began to reflect it! Now, that’s what I call “catching initiation”. The problem is, we caught the wrong initiation. These storms would never amount to anything. In fact, they were so small that when I zoomed out on a RADAR image, they were barely visible! It turned out that, despite the fact that some of the sites I typically look at for weather information indicated some potential, we were in “no man’s land”. The boundary I thought was situated near the CO/KS border was actually farther West, and storms were forming … in Southeast Colorado. So, we had to adjust, headed back into “Colorful Colorado” (although today it would be “Colorful” for different reasons). 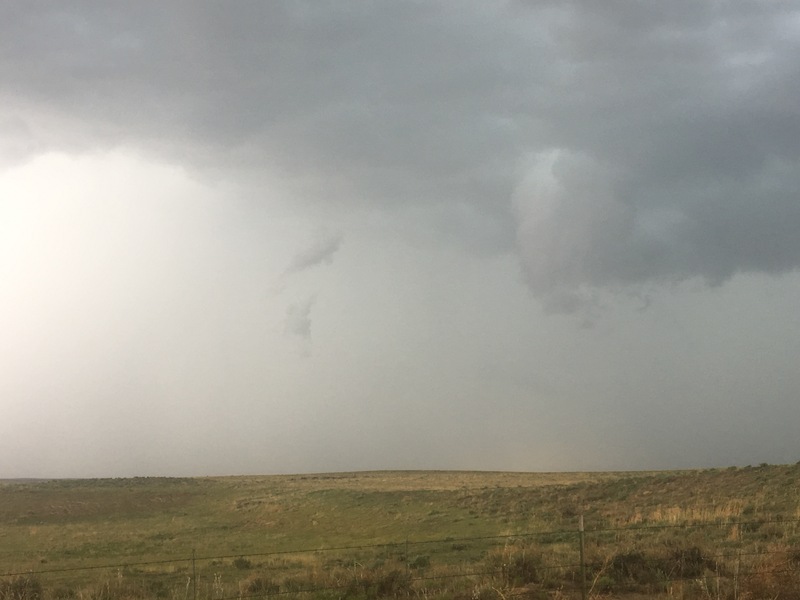 It was there we saw the main feature of the day, a funnel cloud near the town of Lamar, CO.
For a while it looked like it was rotating and trying to form a tornado, but from experience I know that in Eastern Colorado only 1 in 8 of these actually turn into tornadoes. The entire day was kind of a head scratcher. What did my friend see that I didn’t? What did he see that SPC kind of didn’t? Why did so many storms form north and west of where the outlook was? Why did my the information sources I typically point to lead me kind of to the wrong place? I also wonder if I was chasing the right way, and for the right reasons. The weather bends to nobody’s schedule. The weather doesn’t care about personal preferences, conveniences, one’s life situation, or ego. We have tools that provide good guidance into what is going to occur. And, those tools pointed to a clear spot that they were correct about, as the biggest cluster of tornado producing storms of the day formed in Northwest Texas, near Childress, crossed into Southwest Oklahoma, and produced tornadoes. That just didn’t fit into my plan. The chase ended up turning into somewhat of a metaphor, for life decisions in general. When we chose to take part in an activity, of any kind, we get the most out of it when we are willing to go “all in” per say. This is true of jobs, hobbies, relationships, you name it. We have to be willing to adjust, and consider a whole bunch of circumstances and other factors. But, sitting in the middle, waiting for two or more different opportunities to possibly manifest only works well for a little while. In the end, a choice needs to be made, and even if it is not the ideal choice, the fact that a choice was made produced a better outcome than having allowed the entire day to lapse without making one at all. 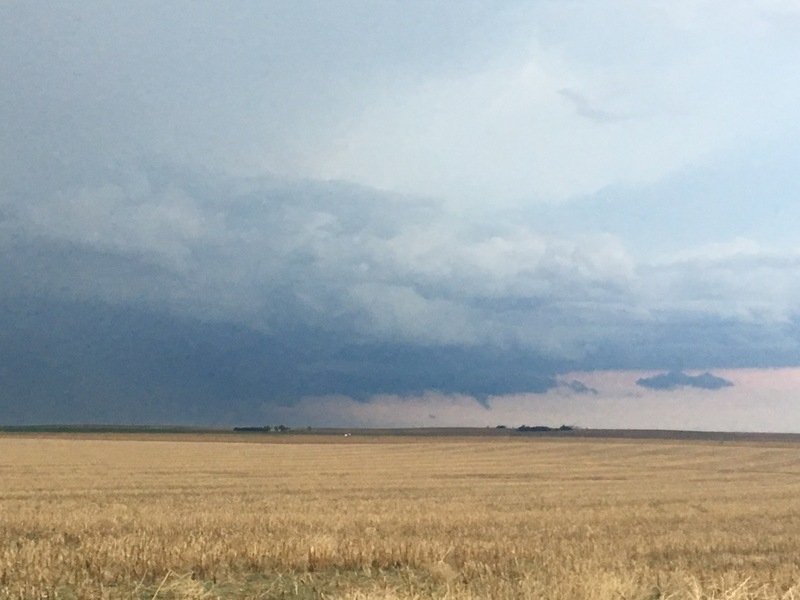 This entry was posted in Colorado, decisions, Kansas, Storm Chasing, weather and tagged Colorado, decisions, Funnel Clouds, Kansas, patience, severe storms, severe weather, Storm Chasing, storm initiation, weather on May 12, 2017 by Stephen Jaye. One of the things that makes this world so amazing is the fact that we never cease to encounter surprises. No matter how well we get to know a subject, any subject, we will encounter, and observe, from time to time, that which does not fit closely into the patterns we have learned. We will periodically be tested, in our knowledge, and forced to rethink, and once again reason out what we have seen based on our critical thinking skills and understanding of our favorite subjects. Like the psychologist that talks to someone new and says “I have never seen this before”, these experiences rekindle the passion we have for that which we love, remind us how complicated the world really is and how little we really know, and remind us about how interesting of a place the world truly is. The 9th of May 2017 was a confusing chase day for me. It is one that I am still trying to figure out, much in the same way the scientific community is still trying to determine why some storms produce tornadoes and others don’t. The day began with a slight risk across Eastern Colorado and New Mexico, and reason to believe, based on model output and expert opinion, that it could be a decent setup for a storm chase in East Central/ Southeastern Colorado. 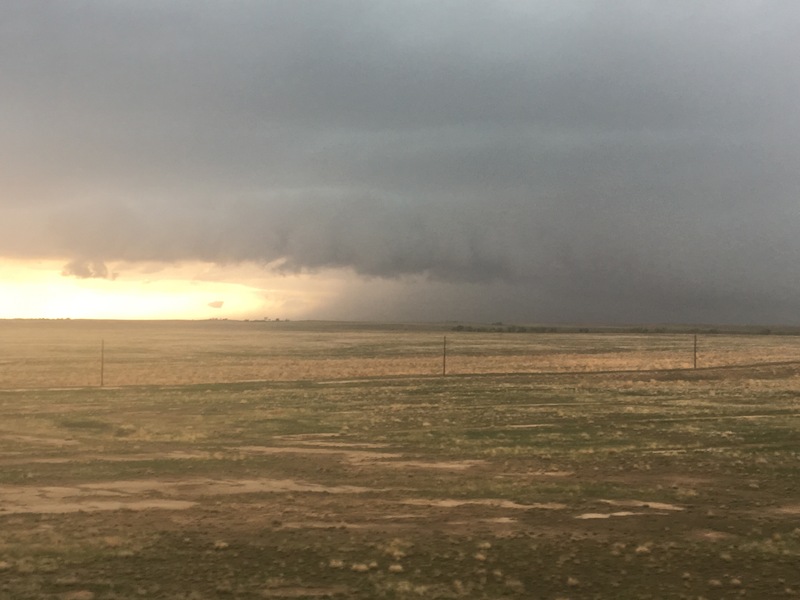 The day ended up being one where I followed over half a dozen storms, over the course of the afternoon and early evening, northeastward, from near La Junta, Colorado, to just north of Goodland, Kansas. Regardless of where a storm was positioned, both relative to other storms, and relative to atmospheric boundaries such as dry-lines (the boundary between moist and dry air), which are credited with creating the lift in the atmosphere that often creates storms, all the storms would behave in much the same sort-of standard but sort-of not manner. They would cluster together and come apart. They had the standard boundary one would observe between the inflow and outflow portions of the storm. Some would even show something that look like a “lowering”, which is often an indication of the mesoscale rotation that causes tornadoes. But, these “lowerings” would show up in some strange sections of the storm, including in the front part of the storm. This is absolutely nothing like how anyone is taught that a “supercell” thunderstorm operates. In the end, storms did occur, but largely outside the region SPC highlighted that morning. And, in the areas of Colorado and Kansas I had chased, nothing more than a couple of hail reports. Although, I am quite certain that there was far more hail than what is shown on this map, as I recall driving through some areas where hail covered the ground, including multiple areas near Burlington, Colorado. I watched these storms tease us all day. Everything just seemed, well, weak. In a typical tornado situation, these random-ish clouds that form around a storm, often referred to by chasers as “scud” (I don’t know why), rise and rotate, indicating that there is indeed, the vertical motion and rotation that produces tornadoes. But, today, the rising and rotating motion in these storms all seemed, well, just weak. It reminded me of a relationship, or a friendship, that just fizzles away as soon as any small change occurs. It was not that there was any kind of real force or circumstance pulling these people apart. It was just that whatever connection they had was not strong at all. That is the way it was with these storms. Something about the entire setup made them behave differently, but I throughout the evening, as I watched the final storms roll away into the sunset. I could not formulate the full reason as to why these storms behaved so differently from a standard severe thunderstorm situation. I am still wondering. Often times severe thunderstorms don’t materialize because one key “ingredient” was missing. Shear, instability, a good boundary, etc. And those often lead to what is refereed to as a “bust day”. It’s just sunny. Or drizzly. May 9th was not a complete “bust”, as there were storms to look at all day. They likely never became severe because everything about the storm setup was just kind of weak: Weak to moderate instability. Border line helicity. A sort of weak boundary. And, just like the storms themselves, with multiple areas of quazi-rotating clouds, the atmosphere as a whole had no real focus. Often times, severe thunderstorms draw upon air from hundreds of miles away for energy. This produces scattered, but strong storms. With hundreds of active storm cells, there was less energy for each individual storm. Of course there are other theories. After all, it could have all been the lack of low-level shear. But, in the end, it felt as if the entire day was telling me something. It was like a crash course in how to create, well, mediocrity. Have only part of what you need before you proceed. Focus on nothing- just spread yourself real thin. And, choose to follow some of the rules, but completely disregard others. 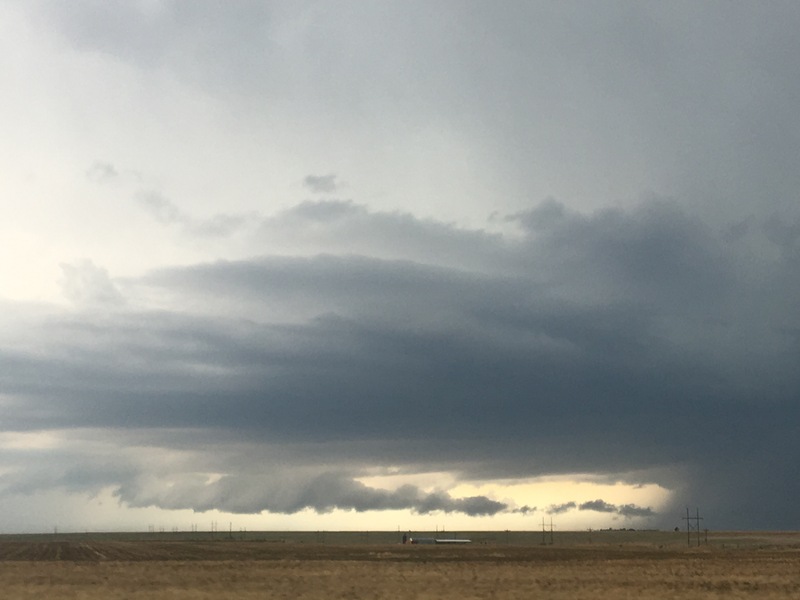 This entry was posted in Kansas, personal habbits, Storm Chasing, weather and tagged Colorado, Kansas, may, RADAR, Storm Chasing, storm prediction, thunderstorms, weather on May 9, 2017 by Stephen Jaye.